Definition: Performance Appraisal is defined as a systematic process, in which the personality and performance of an employee is assessed by the supervisor or manager, against predefined standards, such as knowledge of the job, quality and quantity of output, leadership abilities, attitude towards work, attendance, cooperation, judgment, versatility, health, initiative and so forth. It is also known as performance rating, performance evaluation, employee assessment, performance review, merit rating, etc. Performance Appraisal is carried out to identify the abilities and competencies of an employee for future growth and development. It is aimed at ascertaining the worth of the employee to the organization, in which he/she works. 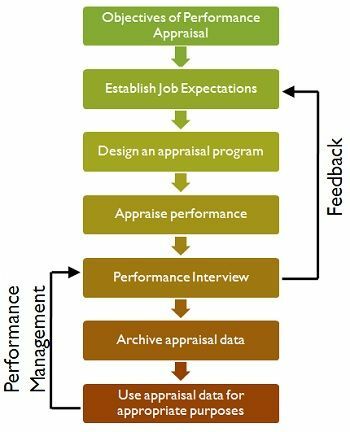 Performance Appraisal relates to job analysis, in the sense that job analysis establishes job requirement, which converts the analysis into standard, on which performance is judged, and results in defining the basis for performance appraisal. To promote the employees, on the basis of performance and competence. To identify the requirement for training and development of employees. To provide confirmation to those employees who are hired as probationary employees, upon completion of the term. To take a decision regarding the hike in employees pay, incentives etc. To facilitate communication between superior and subordinate. To help employees in understanding where they stand in terms of performance. Data obtained from the appraisal of performance, are documented and used for different organizational purposes. The figure shown above is a standard performance appraisal process that takes place in an organization, wherein each step is important and arranged in a systematic manner. The process is conducted periodically, usually twice a year, i.e. semi-annually and annually called as mid-term review and annual review respectively. Performance Appraisal is a part of performance management. It helps in gaining the competitive edge, by improving the performance level of the employees working in the organization, making rational decisions regarding hike in salaries, promotions, transfers, discharge of the employees, reducing job dissatisfaction and employee turnover.